In the second of his two programmed lectures at the Mercury Cinema, special guest film scholar David Bordwell described the second biannual Adelaide Film Festival as being one of the most friendly and rewarding festivals he has experienced. Without even the slightest amount of Mr Bordwell’s qualification on the matter, I can only concur. From 18 February to 3 March, Adelaide’s west end cinemas and the many restaurants, pubs and nightclubs surrounding them played host to an enthusiastic party of relaxed and jovial filmgoers. With weather to match, the Festival’s international program of feature, documentary and short films excelled in both quality and variety. The following touches on only a selection of these gems. Prominent veteran Senegalese filmmaker Ousmane Sembene cannot afford to simply entertain his audience. In a country where literacy reaches approximately 37% of the population, a majority of which are male, feature films necessarily adopt an educational role for their local (and international) audiences. Like a great many important African films, such as Finzan (Cheick Oumar Sissoko, 1989) and Keita (Dani Kouyaté, 1994), Sembene’s new feature Moolaadé (2004) addresses itself to a particular social problem as a means to encourage democratic change on a local community level. 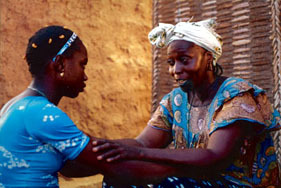 Moolaadé‘s focus is on the ongoing practice of female genital excision in many regional African Islamic communities. The film depicts the story of Colle Ardo Sy (Fatoumata Coulibaly), a bright and progressive peasant woman and mother, whose refusal to allow her daughter’s excision five years ago has led to the general distrust of her more conservative neighbours and local religious authorities. When a group of young girls, aged between five and twelve, escape their own ceremonial excision, they call on Colle Ardo Sy for protection. Heeding the girls’ cries, Colle Ardo Sy establishes a “moolaadé”, a traditional right of asylum, whereby no one can enter her property. As the days pass, the tensions of the religious authorities, both men and women, begin to mount, until, in the face of what they begin to perceive as a serious political threat, regressive measures are taken to ban the community’s access to external media sources, television and radio. This blanket censorship only serves to strengthen the resolve of those who are quietly unhappy with the status quo and a powerful confrontation with the village authorities ensues. Moolaadé is a successful example of activist educational cinema. While its focus is to bring an end to ceremonial excision, the film promotes this reform as being achievable only through the brave and consistent voice of individuals who dare to summon their political autonomy in the face of traditional authority. Sembene’s invaluable point is, I think, that condemning a specific practice as if it exists in a vacuum really doesn’t amount to much. As long as people continue to exploit the power that traditions can bestow upon them, significant attempts toward social reform will inevitably result only further oppression. When a 26 year-old cinephile from the lucky country watches The Last Train (Posledniy Poezd) (2003), he cannot help but come out of it a little sore with this nation’s uninspiring film industry. Written and directed by Alexei A. German, also 26, this film is a serious piece of art both in form and ideological motivation. Like many Russian films, it is set in World War Two. However, in a surprisingly effective turn around, the narrative focuses on the hopeless experiences of German soldiers and officers as they retreat from Stalingrad. Following the winding route of a doctor who has arrived at the receding eastern frontier of Nazi Germany on “the last train”, the sparse narrative proceeds, in a series of superb long takes, through an impenetrable and relentless blizzard, trying to find its way to the wounded, only to watch them die. Unfortunately, for these innocent invaders there is no salvation. The Last Train is an uncompromising condemnation of the rotten fruits of war. With its limited number of actors, extended monologues, precise staging, extended takes and minimal yet prominent sound design, the film joins a Russian tradition of slow paced, contemplative and humanist cinema pioneered by Andrei Tarkovsky and maintained by Alexander Sokurov, Elem Klimov and Aleksai German (the director’s father) among many others. That the film is German’s debut feature only serves to make his achievement all the more bewildering. This is a career to watch. Ignoring, for a moment, the prospective military agenda of the Bush administration, the continued growth of Iranian cinema and its enthusiastic reception in this country shows no signs of waning. With the attendance of Abbas Kiarostami at the 2003 Melbourne International Film Festival and the numerous commercial releases of Iranian films in the past five years, Australians are becoming increasingly familiar to the distinct qualities of this vital national cinema. This year’s Adelaide Film Festival promoted this enthusiasm by including seven Iranian films (two features, four documentaries and one short) and a free forum discussing new Iranian cinema in its extensive program. Unfortunately though, the festival’s focus on Iranian cinema suffered a frustrating setback when special guest filmmaker Bahman Kiarostami (Abbas’ son) confirmed by email his inability to obtain bureaucratic approval to board his flight from Tehran to Melbourne. In the face of such a disappointment, Kiarostami’s arranged interview with American film scholar Godfrey Cheshire was hastily replaced with an open forum discussing trends and developments in Iranian cinema since 1965. Chaired by Flinders University’s Dr. Michael Walsh and featuring festival guests Cheshire and Professor David Bordwell, this relaxed forum covered a wide range of issues, investigating the various forces that have shaped the development of contemporary Iranian cinema. Cheshire, who has spent considerable time in Iran and is working on a forthcoming publication on Iranian cinema, made some particularly revealing comments on the hierarchical organisation of Iran’s film industry. He especially emphasised Abbas Kiarostami’s role not so much as a cinematic voice for Iranians, but rather as symbolic representative for the industry to international viewers at the many festivals where his films are exhibited. Also of considerable interest was Cheshire’s discussion of the consistencies between the storytelling techniques in certain canonised works of Persian literature and the distinctive narrative approaches evident in recent Iranian films. While many would like to interpret the formal experimentation of films like Close-Up (1990) or The Wind Will Carry Us (Baad Mara Khahad Bord) (1999) as being largely motivated by European art cinema, Cheshire shed light on the entirely reasonable possibility that our cultural conditioning towards transparent, realist film dramas may not be a global norm. Immediately following this forum was a screening of two documentaries directed by Bahman Kiarostami. Infidels (Koffar) (2003) explores the lifestyles of the Godars, a north Iranian ethnic minority whose enforced religious conversion from a form of animism to Islam has done little to alter their distinct cultural and economic practices. Pilgrimage (Ziarat) (2004), on the other hand, depicts the administrative nightmare facing Iranians wishing to visit the holy shrine of Imam Hussain in Iraq since the fall of Saddam’s regime. While differing greatly in political focus, both films illustrated Kiarostami Junior’s refined observational talent for evoking personal testimonies from his subjects. Pilgrimage, the more substantial of the two films, was particularly distinguished by the wide demographic range of its interviewees. Even among the interviewed Iranian clerics, one could not fail to notice the disparity of opinions regarding the US led occupation of Iraq and the resulting conflicts generated between the region’s new chaotic political infrastructure and its traditional Muslim practices. Bahman Kiarostami is clearly a documentarian of considerable weight, an original creative personality quite distinct from his father’s. It is with hopeful anticipation that he will be successful in attending the 2007 Adelaide Film Festival. 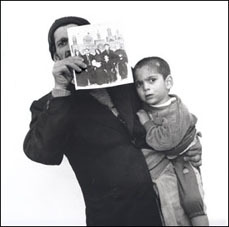 The other Iranian film of great interest for this reviewer was Mohsen Amiryoussefi’s feature Bitter Dream (Khab é talkh) (2004). Perhaps of all significant national film industries, Iran’s is the one most would assume to be unaccommodating to black comedy. While there are no doubt some humorous moments in many Iranian films, their comedy has, for whatever reason, generally been couched within a warm benevolence. Bitter Dream changes all that. An achingly funny exploration of human weakness, it tells the story of Esfandiar (Abbas Esfandiar), a corpse washer unanimously disliked by his employees and neighbours. Apprehending a sense his own immanent death, Esfandiar realises the extent of his own human loneliness and attempts to forge a better relationship with the people he has mistreated for so many years. The sardonic twist on this potential tale of redemption is that for all his good intentions, Esfandiar, looking literally like an old hound, really is a stubborn and miserable old brute. Any forgiveness he receives is at best half-baked. Incorporating some refined visual compositions and sequences (for which it received a special mention at Cannes, 2004) as well as some highly entertaining performances (played by the actual employees of the graveyard), Bitter Dream opens a whole new window into the increasingly bright house of Iranian film. Isn’t the history of film an absurd enterprise…? Take French cinema, par example. The Impressionists of the 1920s forge their style in reaction to the theatrical serials of Feuillade. The classicists of the 1930s and ’40s, in turn, revolt against their predecessors’ modernist abstraction by renewing a realist, transparent drama. The nouvelle vague then follows up in the 1950s and ’60s by condemning this cinema of quality, reinvigorating interest in the abstract potentialities of narrative film. And so it goes on. For while many wish to see Godard and company as the end point of the history of French film art (no doubt fearing their own mortality and the growing irrelevance of May 1968) the cinema continues, as only it can, to swallow the past, tranquillising its momentous events and putting the radicals back in their place. Arnaud Desplechin’s new feature Kings and Queen (Rois et reine) (2004) supports this prognosis. A fine drama, it follows the experiences of Nora (Emmanuelle Devos), in the days leading up to her father’s death from cancer, and her ex-husband Ismael (Mathieu Almaric), whose suicidal behaviour has led to his enforced institutionalisation in a mental hospital. As the days and weeks pass, Nora and Ismael are simultaneously forced to reflect on their own selfishness, delusions and fears, unable to move on until their own pasts are confronted, their responsibilities accepted. Indeed, by the end of the film both central characters seem to have palpably aged, both physically and emotionally, becoming something resembling adults, parents. To this extent, Kings and Queen is something of a literary masterwork of a feature, an emotionally involving and inventive drama not unlike P. T. Anderson’s American family epics. And yet, what struck this reviewer most resonantly about Kings and Queen was not the prowess and caring delicacy involved in its dramatic development, but rather the almost natural way in which Desplechin employs the apparently subversive aesthetic tactics of Godard in order to compose a transparent drama. The film uses jump-cuts, obtrusive snippets of popular music, interviews with the characters, even moments when the set disappears completely, leaving the actors in darkness as if on a stage. Yet for all these forays into the realm of art cinema, Kings and Queen remains a conventional film drama. Could it be that the incessant film school reruns of À Bout de souffle have resulted in a normalisation of avant-garde procedures, at least in the eyes of those like Desplechin, those weaned on the work of their nouvelle vague fathers, grandfathers? Indeed. If Kings and Queen is to be celebrated as an accomplished and significant French film, as it certainly was by many at this year’s festival, there appears little choice but to usher in a new definition of the cinema of quality, one pioneered by the boys from Cahiers. If all directorial greats drew in crowds like Jean-Luc Godard the world would be a better place. After sell-out crowds at the 2002 and 2004 Melbourne International Film Festivals, the ubiquitous septuagenarian’s new work Notre Musique (2004) received one of the festival’s largest turnouts for its Tuesday night screening. And while it seemed that many left the 80 minute session with their discomfort for Godard, and thus all art cinema, intact, it was to my own great surprise that I found myself not only thinking rampantly about the film, but deeply moved as well. Notre Musique (Our Music) is perhaps the most cogent and effective political film Godard has made. According to a three-movement pattern based on The Divine Comedy (Hell, Purgatory, Heaven), the film depicts a retro-genesis from Apocalypse to Eden and considers this mythology in terms of the current conflicts within the Jewish, Christian and Muslim world, principally Israel and Palestine. Godard’s primary concern, at least in the 60 minute Purgatory section, is an attempt to illustrate the dialectical relationship his art has with the life it strives to understand. As he is required, being a filmmaker, to maintain a constant separation from his subject (a situation he explains in the film as being somewhat like an unedited shot-reverse-shot) the only political effect his film can have will be the product of dialogue. The same goes for enemies, who only exist as enemies because they are co-dependent: Israelis and Palestinians, who dream “not of the enemy, but of themselves.” We are thus encouraged to maintain a consistent recognition of the two-sidedness of any artistic experience and, indeed, of any human action or thought. Godard asks us to realise that sitting there, simply absorbing his film, is, for both him and us, like having a lock with no key, or vice-versa. In short, we have to mind the gap and build a bridge. Notre Musique is a fervent political and religious statement from an apparently disappointed man. From its opening images of children burnt to death by the most recent invaders of Iraq, it condemns the arrogant behaviour of the Christian and Jewish first-world and tries, somewhat exhaustedly, to intellectually liberate its audience from single mindedness. In Raul Ruiz’s latest baroque farce, A Taste for Murder (Une Place parmi les vivants) (2003), the serial killer whose crimes plot out the film’s narrative unfolding is finally cornered and asked to explain his motivation for choosing his victims. “Because they were there” is his reply. This negative logic applies equally to Ruiz’s approach to narrative filmmaking. Like Jacques Tati, Ruiz seems primarily motivated into making his films because they represent a means to explore the possibilities of the filmmaking process. In light of this, a detective story like A Taste for Murder is particularly well suited to Ruizian adaptation. Running parallel to one another, the film’s story and its stylistic construction instigate the audience into a system of clues and red herrings. Objects – baguettes, newspapers, champagne flutes – and throwaway lines of dialogue enter and exit our field of attention, provoking us into a search for the mystery’s solution. Just when it seems obvious, when both the criminal’s and artist’s motivations seem solved, Ruiz turns the tables and reveals that we are in fact further from the end point than when we began. After a 35 year career of doing this one would think we might have learnt by now. Of course, A Taste for Murder is not everyone’s idea of an enjoyable Friday afternoon at the flicks. What, many may ask, is the relevance of a film aimed squarely at confusing its audience with technical pranks, a film where the movement of props seems more important than the revelation of narrative information? Such questions are understandable and not easy to answer. In true Ruizian spirit, perhaps the only possible response is to keep the questions going: Why are we so hell bent on narrative resolution, so excited over the idea of conquering a work, of letting it gather dust on a shelf? Is this desire for closure in fact a reflection of our own attitude towards life? Do we so desperately want it all to be over and done with? Keeping in mind the film title’s literal translation, “a place among the living”, could it be that behind the jester suit Ruiz is in fact offering us another way to live, a means to triumph over the seriousness of mortality, a way to enjoy the process for its own sake? Though I consider Jia Zhangke’s The World (Shijie) (2004) to be the finest film I witnessed at the Festival, the task of describing its values puts me in a rather humiliating position. For though The World is Jia’s fourth feature film, I must confess to never having previously noticed the director. The film’s story is conceptually interesting enough: a newly opened Beijing theme park called “The World”, displaying replicas of monuments from all across the globe, plays host to the ups and downs of its many Chinese and international employees. Set off by the Valley of Kings, Big Ben, the Twin Towers and other imperial relics, the park’s performers, security guards and maintenance people establish bonds of friendship, love and anger while trying to maintain a foothold on their existence in an impossibly complicated society of fading borders and differentiated ring tones. However, despite the fact that this synopsis alone is enough to keep Baudrillard scholars entertained for weeks, the great value of this film resides, not in any beliefs that it imparts on its audience, but rather in the ways that our perceptions are stimulated into participating in the film’s construction. Using predominantly long moving takes, Jia motivates his audience into exploring the frame, following the shot’s development, and engaging in a sense of revelation when we discover, six minutes into the take, that the Taj Mahal has been a metre away from the characters all this time, or that a giant Hello Kitty doll has been silently watching the action with us. So it is with sound, too. Over time we come to recognise whose phone is ringing, whose laughter that is. These are values, of recognition and revelation, have been long recognised by filmmakers and critics, yet they are so rarely implemented in modern cinema. I came out of The World feeling like I had just experienced a great classical piece; a Renoir, an Ozu, a Tarkovsky, works the film pays explicit homage to. And to think, all this enthusiasm from a person who didn’t even know the name Jia Zhangke when he sat down for the screening. As stated, the films reviewed here barely scrape the surface of the Festival’s program. Other highlights included the Australian premieres of Café Lumière (Kohi jikou) (Hou Hsiao-hsien, 2004) and 2046 (Wong Kar-wai, 2004), both of which will no doubt headline 2005 festivals across the world. The Danish film Brothers (Brødre) (Susanne Bier, 2004) generated a considerable amount of foyer discussion, while the Festival’s South American focus found strong representation in Machuca (Andrés Wood, 2004), Whisky (Juan Pablo Rebella and Pablo Stoll, 2004) and The Holy Girl (La Niña santa) (Lucrecia Martel, 2004). The world’s most famous cinematic daredevil Werner Herzog also featured multifariously as both filmmaker, in his new documentary The White Diamond (2004), and protagonist, in Zak Penn’s topsy-turvy farce Incident at Loch Ness (2003). Many found visceral enlightenment in Mathew Barney’s five-part Cremaster Cycle (1994–2002) and in the many screenings and workshops held by Festival guests Shynola. The Festival’s extensive documentary received considerable praise for the Scandinavian co-production The 3 Rooms of Melancholia (Melancholian 3 Huonetta) (Pirjo Honkasalo, 2004), the Chinese Delamu (Tian Zhuangzhuang, 2004) and Lars von Trier and Jørgen Leith’s shamelessly brilliant The Five Obstructions (De fem benspænd) (2003). Biopics also abounded in various shapes and sizes. Especially effective were the Chilean Salvador Allende (Patricio Guzman, 2003) and the Danish Tintin and I (Tintin et moi) (Anders Østergaard, 2003). The 2005 Adelaide Film Festival illustrated the west end of Adelaide’s unique capacity to host an intimate communal event within a city centre. Thanks and recognition for the fortnight’s success must go to all who worked and volunteered for the many months leading up to the Festival. In particular, the programming team should be praised for the enthusiasm and fine taste with which they undertook the enormous task of leading the Adelaide Film Festival into an established cultural position, in this city, in this nation and the this world. Thomas Redwood is a post graduate student at Flinders University Screen Studies department.